This is likely to be considered one of the strangest articles on the Baristador Coffee website because I am not even sure it should go up. A short time ago, my espresso machine packed up and I resorted to my stovetop espresso maker. There is nothing too wrong with that state of affairs except that it meant I had a long black in front of me instead of my usual short black. For some strange reason, at that moment I channelled the late, great Johnny Cash and his song, Man In Black. 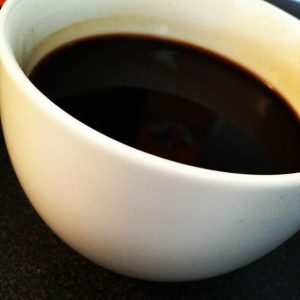 Coffee poured, words poured, and I shared some lyrics that day with a photo of my long black. Well, as luck would (or wouldn’t) have it, during a karaoke session last night, I was secretly recorded mucking around with those lyrics and since the damage has now been done I have decided to share the opening verses. NOTE: No offence intended toward latte drinkers. the aroma is my focus ‘fore it’s gone. LOL Thank you Brett, however, I think I will stick to my day job.